Come for a visit us! Drop in, tour our schools, and learn more about our programs. For more information or to schedule a different time, please call (856) 661-1700 #1010. UrbanPromise Schools provide a college-preparatory Christian education to each and every child who joins our learning community.We believe that education is a journey; one that does not end with a high school diploma, but rather with a young adult prepared for life’s challenges, poised for academic success and positioned to make a positive impact in his or her community and in the world. We invite you to learn more about our school, our philosophy of education and the outstanding young people who are UrbanPromise. Parents and guardians can begin the application process by turning in an Inquiry form and the following documents: a copy of the student’s birth certificate, most recent report card, and IEP, if applicable. Prospective students and parents need to visit the school either during an open house or at an individually scheduled time, complete the TerraNova test, and meet with school leadership. A formal offer of admission will include information about the scholarship the student is eligible to receive and their tuition costs. If an offer of admission is made, families move onto step 4. The final step to ensure a seat in the school for your child is to complete the registration paperwork and make the first two tuition payments during the summer. 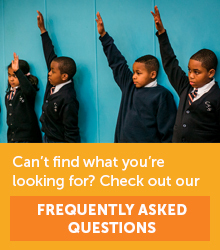 Parents who are interested in enrolling their child in the CamdenForward School or UrbanPromise Academy must complete the inquiry form below. Once your inquiry form has been received we will contact you to schedule a student testing date and parent and student orientation. All prospective students must complete the Terra Nova test. There is a $35 fee to take the test. This fee will be credited to the student’s first month’s tuition if the student enrolls at the school. Finally, a staff member will conduct an informal interview with the student and family. The interview may be waived for CFS students. All three of these things can be completed in one visit or spread out over more than one visit to the school. Families should also have completed the K-to-College Scholarship application by their informal interview so the principal can calculate their scholarship for next year. A formal offer is made by the school and will include information about the scholarship the student is eligible to receive and their tuition costs. Registration paperwork includes the Enrollment Agreement, Health/Medical forms, transcript request form, Pinnacle enrollment form (only for UPA students), 8th grade diploma (if entering 9th grade), and Bus Transportation form (if the student lives more than 2 miles from the school). Once this paperwork is complete and families have paid the first month’s tuition (1/10th of their total tuition), their student’s seat is reserved. Families must pay a second month’s tuition by August 20th in order to hold their student’s seat. Families will also get information about topics like uniforms, school supplies, and the school calendar.